I once heard someone say about Iceland, “This place is what it would be like, if someone was on a computer and had designed a whole new planet, and needed to test out all of the features. Maybe once they were all approved, then they began adding them to the rest of the world.” This may sound crazy, but I would have to agree, and here are a few of my reasons why. Iceland is commonly known as the Island of Fire and Ice. Nowhere in the rest of the world, is there such close proximity between glaciers and volcanos. Yes, you have read me correctly: our planet’s coldest features as well as its hottest, are on the same island and within just a few short miles of each other! You could have a wedding inside a glacial chapel, and the reception near the lava fields, immediately after! Iceland didn’t get its name for lack of reasons: over eleven percent of the island is covered by glaciers and ice caps. However, not to be outdone by the ice, there are a staggering number of volcanoes. One hundred thirty volcanic mountains to be exact, which have been discovered to date! I find that number to be absolutely mind boggling! The majority of these volcanic mountains are considered to be extinct. However, there have been eighteen which are documented as active, while lava continues to seep and flow out of a few of them to this day. These active eruptions have been dated as far back as 900 CE, which was around the historical date of the original settlers who laid claim to the land! Do not let me distract from the fact that there are many more breathtaking and fascinating natural wonders this small country is known to showcase. From the melted snow, there are rivers and waterfalls as clear as glass, as tall as ten story buildings. There are geysers known to blow their steam off from time to time. One of which, is punctual enough to blow every four to eight minutes like clock work. Enough consistency for some of the local islanders to set their clocks by! The island is so close to the arctic circle, the topmost peninsula of her land, almost reaches the official latitude! Aurora Borealis doesn’t mind this shortcoming of Iceland’s reach. The star laden skies of dark winter nights become the center stage, and can become engulfed within a shifting color pattern of whites, greens, pinks, and purples that dance across the sky. It is common and regular to residents, while also being considered elusive at best. It should not be considered required to see, but instead as an added bonus to a magnificent trip! There are numerous hot springs casually displaced all over the island, ensuring you always have a warm bath, if you were to need one mid-hike. 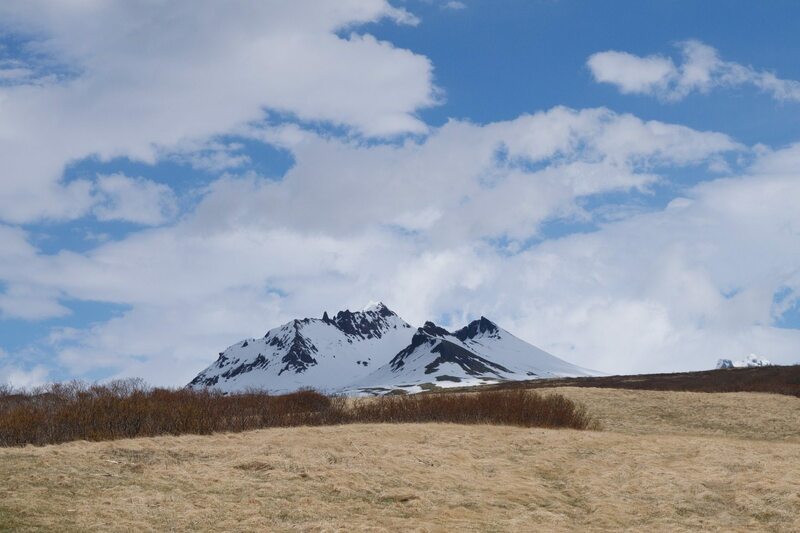 There’s nothing quite like seeing a volcano in the distance, while bathing in a hot spring surrounded by glaciers. Even the wildlife are vastly different from the rest of the world! Icelandic horses are smaller, and have much cooler(pun intended) personalities than their anxious and often overly cautious cousin horses of the rest of the world. Iceland protects these animals, by not allowing other breeds of horses into the country, and once an Icelandic horse has left the country, it is strictly prohibited from re-entry into the country. Just behind tourism, the country’s largest industry is also one of their major exports: the fishing industry. It is so large, that it accounts for more fish than the rest of the entire European Union combined! This guide is a way for you to better familiarize yourself with the natural glacial beauties of this seemingly magical world not so far, far away. Through research and personal experience from my own visits, I hope to help describe and reveal to you some of Iceland’s natural magnificence! It is a place that we all should visit numerous times in our life. I hope to influence you into action, and you experience the world of Iceland for yourself and loved ones, as words and pictures are simply not enough. Take my … word … for it. With just over eleven percent of the country covered in these ancient ice formations, it would be nice to know what they are, and how they are able to exist near lava. If we were using sound logic, we could assume the areas that were too close to the volcanic mountains would already have melted. Well, logic be damned in Iceland! Many of the glaciers sit above volcanoes, and when met with lava, the fire wins. There are spots where the lava flash floods can cause glacial lakes and rivers, which can be quite the issue to have to deal with! How can it be possible, they coexist as such? Quite simply really. The winter snow is a constant and expected event. On the other hand, the eruption of volcanos are sporadic and random. This is due to the tectonic plates, which we will talk about later. 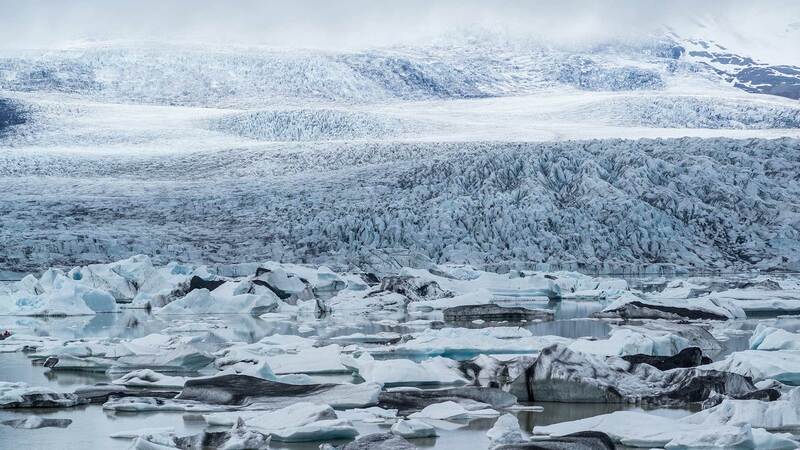 But first, let us learn about the creation of the glaciers, before I tell you about the popular guides and tours of the magnificent Icelandic glaciers that can be visited. As I had mentioned before, the snow falling in the winter is not a “maybe,” but instead is an absolute that happens every year. Even moreso while experiencing an ice age, the earth is not warm enough during the summer to melt all of the winter’s snowfall away. After countless years of snow, its own weight helps compress the bottom of the snow. Starting after just two or three winters of this compression due to weight, the bottommost snow turns into something called firn . This is a state of water that is not often talked about in normal education. Firn is an intermediate state when snow crystals are becoming more and more dense. The air between the crystals of snow are squeezed out of the bottommost of snow and the firn begins to stack into itself. As the density increases, so does the compression, and the firn then becomes a sheet of ice. During a glacial age, the earth is not cold enough to slow this process down. This process of forming a glacier miles thick, takes around 100 years to form. But with an ice age being an approximate 10,000 years in length, glaciers have plenty of time to form into massive sizes. At the peak of an ice age, the entire earth is covered beneath glaciers by a whopping thirty percent of surface area! Luckily we’re on the opposite side of that 20,000 year cycle! 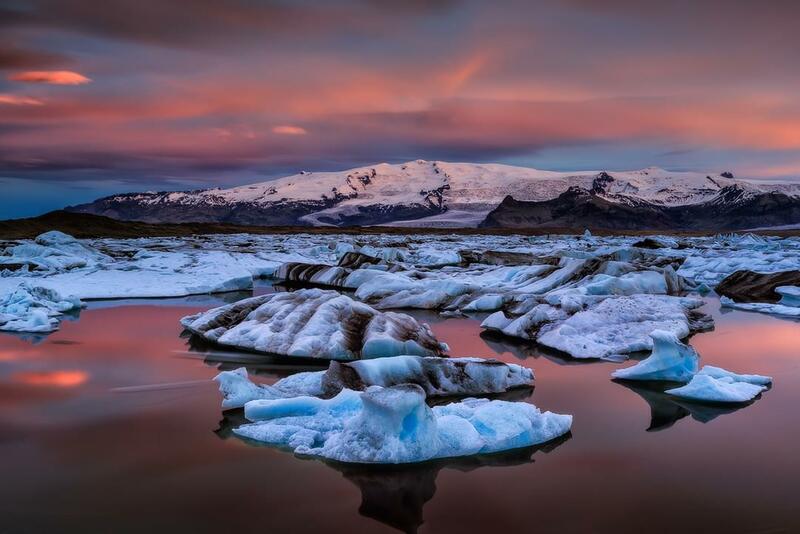 Vatnajökull which translates to “Water Glacier,” is an estimated 5,160 square miles in size, at an elevation beginning at 6,919 feet above sea level. The glacier ice is nearly a mile and a half thick in some areas! Not only is it the largest glacier in Iceland, but it holds the title as the largest glacier in all of Europe. As a reference, you could squeeze almost all of the islands of the Bahamas within the total area this one glacier represents. But something tells me, I just don’t think the people who wanted a warm vacation on the beach in bikinis, would take too kindly of you trying this. At least provide parkas and a hot cup of coffee if you do. They will most certainly need it for such a rude awakening. Then again, being on a glacier in a bikini would be freezing, so I’m sure they would be awake at that point. Maybe offer warm pants as well. 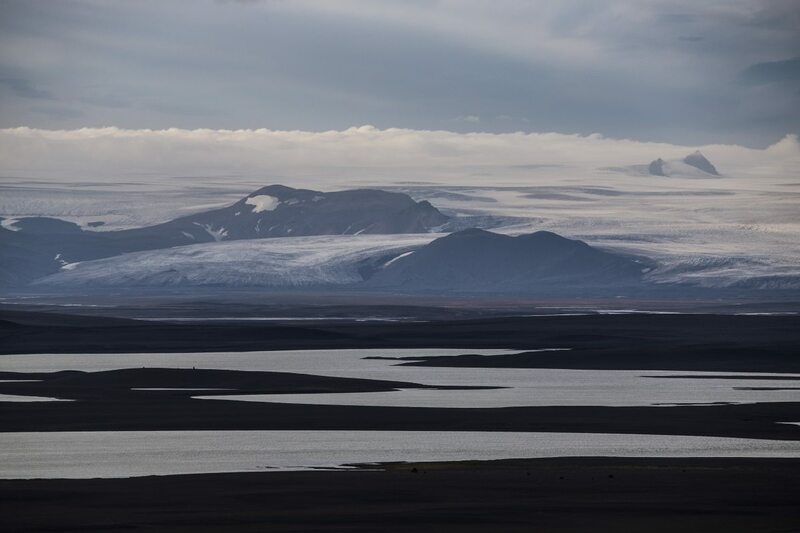 Iceland has declared the area surrounding Vatnajökull, a national park. It is located on the south eastern region of the island, and has a total area of 8,700 square miles of protected land. 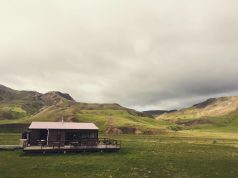 The park is comprised of snow covered mountains, active geothermal lakes and river runoffs, waterfalls, caves of ice, and obviously the Vatnajökull glacier. Due to the sheer size of the park, there are countless tours of varying levels of adventure. Nothing will beat hiking the glacier itself, and there are numerous options available to do so. From short introductory hikes, half day hikes, and deep treks into the park, there is surely a way for you to absorb the breathtaking sceneries of an extreme existence in nature. If you are a mountain climber, there is even a tour for scaling ice, which takes you up the side of the glacier, and tours to climb down into the crevices and fissures of the always moving glaciers as well! If there is one thing you simply cannot skip, it is the Svartifoss waterfall. It is one of the most popular tourist attractions in all of Iceland, and for a good reason. It is surrounded by an incredible amphitheater made up of dark colored lava columns. These dark features are what inspired its name, Svartifoss, which directly translates into Black Falls. Although the geography stays the same, seeing the falls in the summer time is a much different scene, than during the winter months. Regardless of when you go, you are in for a treat. 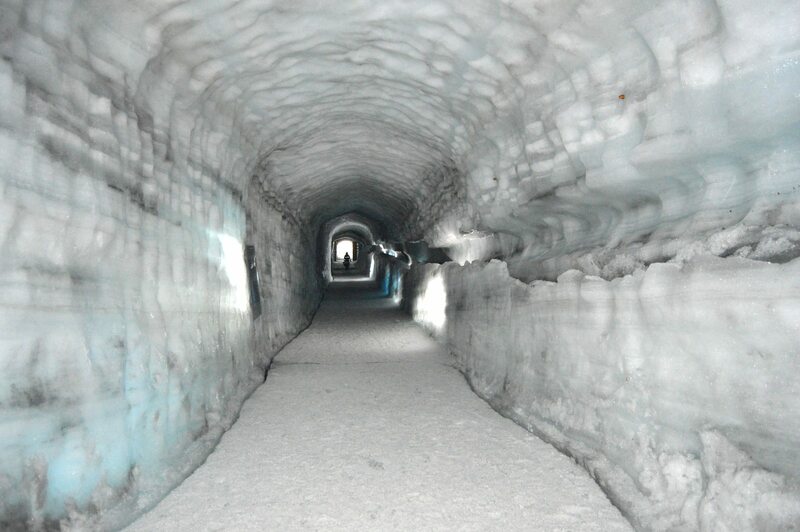 There are tours provided by Into The Glacier Experience. If you feel like riding a boat, there are waterborne tours on rubber zodiac boats, like the ones US Navy SEALS use! I’m sure the tours are sailed at a much slower pace, as tourists falling out of the boat could be bad for business. These tours are provided by Ice Lagoon Adventure Boat Tours. 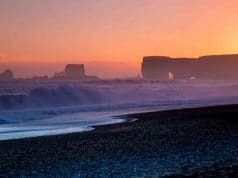 When traveling for any of these guided tours, from the capital of Reykjavík, plan on driving 4 hours east on Route 1 for about 200 miles. You’ll find your destination in a town named Hof. With four visitor centers, it is easy to spend time hiking, exploring, and sightseeing. Most of the tours, are based somewhere close to this town. Hof is a good starting point for all of the activities that are specializing in experiencing Iceland’s largest glacier! Langjökull is the second largest glacier in Iceland, and translates to “Long Glacier.” It is an estimated 592 square miles at an elevation of 4,760 feet above sea level, with a maximum ice thickness of 1,900 feet. This makes it not only the second largest glacier in Iceland, but the second largest glacier in Europe as well! It is one of the many glaciers that have had time to rest upon volcanic regions. Lucky for it, the volcanic mountains it currently rests in, are quite inactive. It’s area has only erupted 32 times in the last 10,000 years. 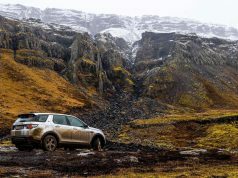 From the capital of Reykjavík, driving is 83 miles of road, and will take you an estimated hour and forty five minutes to get to base camp, located near Húsafell. Langjökull is famously known for its newly completed ice tunnel, which is the longest ice tunnel in the world. It stretches a whopping 2,624 feet into the glacier, and down nearly 1,000 feet deep! Along the trip, you will notice the white ice turn into a deep blue as you walk deeper and deeper into the cave. Luckily, the tour will provide with crampons for your shoes, as even the best hiking boots are worthless when walking across ice. They also provide warm clothing to layer up, because the temperature is well beyond freezing, in the middle of the ice. Obviously. The most interesting feature of this ice cave, is their very own chapel! You can literally get married deep within an ice cave! If only this was available when I said my vows. Then again, I’m sure my wife would rather have had a beautiful dress out in the open for all of her friends and family to see. Besides, I’m not sure if anyone makes a wedding parka. If you were to choose a time to see the ice cave, I would suggest going in the summer. This is because the trek in order to get to the entrance of the cave can be a treacherous one, even though you’re driven by expert guides. You will be riding in an eight wheeled custom vehicle designed just for traversing the snow. During the summer, there is less fresh snow on the ground and a less likely potential for hidden crevices to traverse on the way. Otherwise, it’s a potentially dangerous adventure, just to get there and back! The tour is also ran by the company “Into The Glacier Experience,” and they coordinate everything. Packages vary, from being picked up and driven all the way to the tunnel entrance, warmer layers of clothing, the crampons for your boots, and lunch. It’s a fairly long tour, as they do quite a bit of traveling, but it is absolutely worth it! Hofsjökull is the third largest glacier in Iceland, and translates to “Temple Glacier.” It is close in size, with Langjökull, being an estimated 575 square miles of area at an elevation of 5,790 feet above sea level. Iceland once again throws out the narrative of logic, against the narratives and reports of global warming. This glacier was able to increase its mass in 2015 and beyond. Something that hasn’t happened in over 20 years! The glacier is located in the central highlands of the area, and is also sitting atop the largest active volcanic mountains on the island! It’s a strange wonder, that it’s able to do this. The glacier is the source of the Thjorsa river, which is the largest river in Iceland. 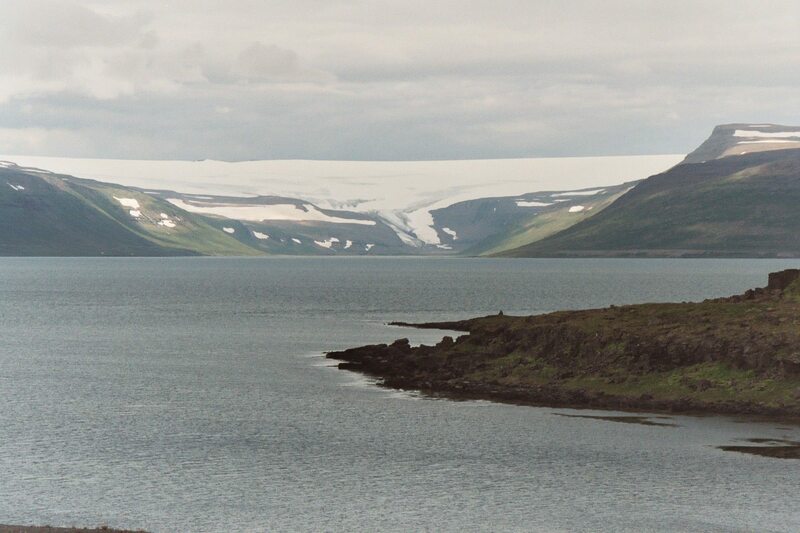 Because of the difficulty in location, this is not a glacier that is generally visited, but instead it is viewed from a distance. They say when the weather is nice enough, it can be seen from the Langjökull glacier. 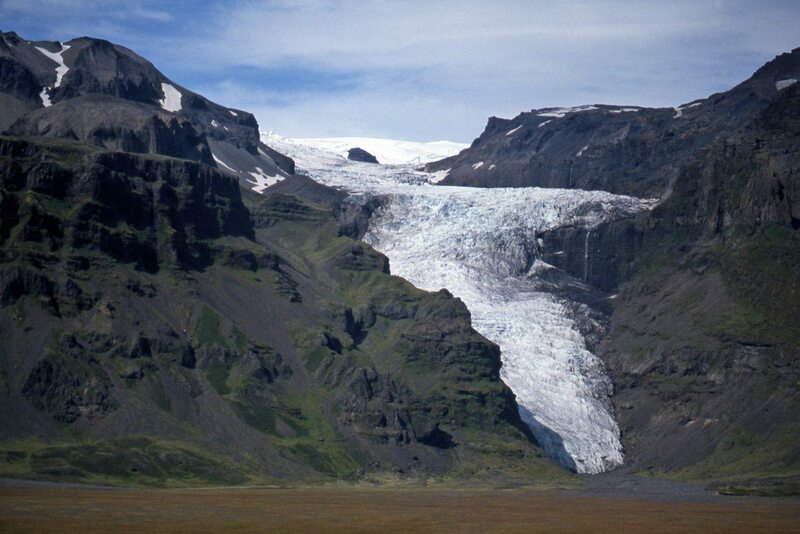 Mýrdalsjökull is the fourth largest of ice masses, and considered to be an ice cap. It translates to “Mire Valley Glacier.” It is within the southernmost mountains of the island. Just north of the town Vik (home of Dyrholaey and more), it is located on another one of Iceland’s active volcanoes. I’m sure you’ve recognized that I am beginning to talk about a trend here. The glaciers and ice caps don’t seem to give a damn about logic or reason! Luckily the mountains only erupt generally every forty to eighty years, with the last one being in 1918. On the last eruption, there was enough lava flow to extend the base of the island by just over three miles! There have been 16 eruptions since the history of the island has been recorded, dating back to 930 AD. People were afraid of crossing the plains near the front of the volcano, due to the frequent flooding and deep rivers that were required to cross. But just because there is now a road, doesn’t mean it’s not vulnerable during catastrophic events. It is said, without accounting for glacial water runoff, the area is a recipient of an insanely generous thirty three feet of precipitation annually! Tours are available, based out of the town of Vik. To get there from the capital, you’re looking at a two and a half hour drive, following Route 1, for 111 miles east. There are tours for hiking, snowmobiling, riding ATVs, and even horseback riding. One company that provides tours is with Arcanum Glacier Tours . Drangajökull is notably smaller than the first four glaciers that have been listed above. It is between 62 and 77 miles, with an elevation starting at 3,035 feet. It is the northernmost glacier in Iceland, and the only glacier that has not gotten any smaller in recent years. It is located in the western fjordlands. There are tours all around the westfjords, that offer various activities, such as hiking, boat tours, kayaking, horseback riding, whale watching, and more. One such company that provides these tours, is West Tours . Do not attempt to scale or hike these glaciers on your own. The guided tours are intimately knowledgeable with the safe routes to allow for the best possible tours, while minimizing any risks. The tour guides know what any hazardous conditions may look like, and identify them as they present themselves. Be honest with your own abilities. If you live a sedentary lifestyle, do not plan to go on 8 days of hiking. You will most likely ruin your trip, by being too sore after the second day! Unless you’re staying up for the Northern Lights, try to get some rest. Your body will need it to repair, as you exert more energy than usual. If you’re driving, pay careful attention to the roads. If you see something beautiful, pull over to admire it in safety. Try as many local eateries as possible. The Icelandic cuisine prides itself on being the freshest, purest, self sustained food in the world. It will not disappoint you. Make sure you have plenty of memory cards for your camera, and possibly a couple of batteries. Bring a small notebook, because you can describe your emotional responses to the breathtaking beauty of Iceland’s majestic landscape. While being a small country, Iceland prides itself on being very modern. Even the smallest of village shops will usually be digitally linked to the modern world. Bring your debit card, as you won’t have to exchange for cash nearly anywhere in the country! Don’t forget to let your bank know of your trip first, otherwise they’ll freeze your account faster than a glacier!